Phuket Fit reports, "numbers are growing ever more rapidly as word spreads globally of our new services." Phuket Fit describes itself as "a healthy environment where our guests can escape the stress of everyday life and get a fresh start." A Phuket Fit spokesperson tells us, "with recent upgrades to our facilities and services, there have been positive reviews on Phuket Fit online and also offline too. This is believed to be the reason why more and more people from around the world are choosing Phuket Fit." One guest, Jane 31 from Australia, said, "having been to Detox retreats in Phuket and other weight loss resorts in Thailand, it is clear that Phuket Fit is head and shoulders above the rest. Their team are so committed and have a real passion for helping people." Another, Katey 27 from the UK, mentioned, "this place [Phuket Fit] has been a life changing experience for me. I've lost almost 19 pounds in 14 days! I'm also feeling fitter and healthier than I ever have in my life before!" 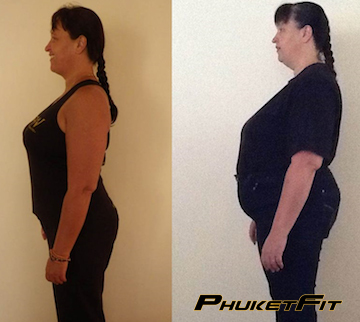 "When I saw the website from my home in England, I was definitely interested about Phuket Fit, but I was also skeptical about the claims and results that I could get. I'm over 50 after all and didn't think that I had it in me to make a come back. But I can testify to the fact, that the trainers at Phuket Fit and the weight loss program that they've had me on, has absolutely transformed my belief about whats possible. It's still staggering to think that I've managed to achieve so much in so little time. And that's me, I'm over 50! It really has been rewarding."